Revolutionary Canceled | Revolutions for Fun and Profit! Unfortunately, I’ve decided at this time to cancel the revolution against earthquakes. Yesterday I posted about a new Facebook group that I had started, Citizens United Against Earthquakes. As you know, earthquakes are a very real menace in our world, and it was my intention to start a revolt to get earthquakes to stop being so menacing. 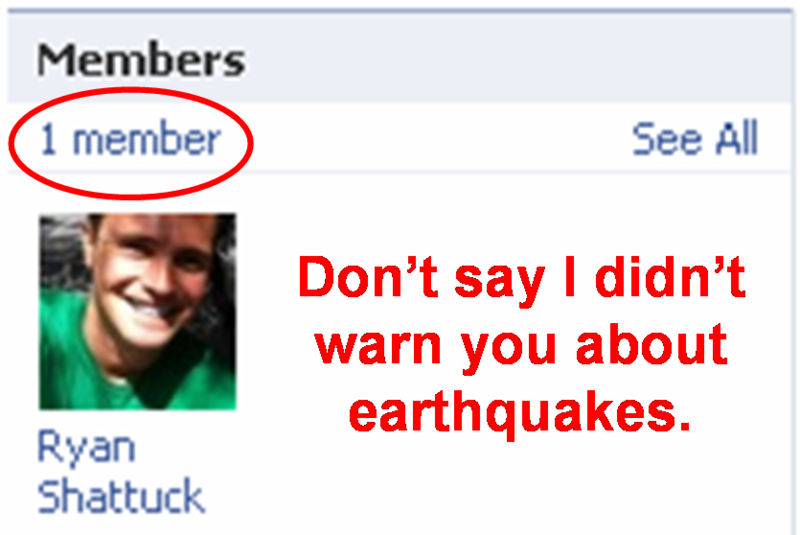 Sadly, nobody joined the Facebook group, leading me to believe that you have no problem with earthquakes. Fine. When an earthquake threatens to knock down your house, don’t come crying to me because you were too lazy to join my Facebook group.